If you do your taxes yourself and participate in an employee stock purchase plan(ESPP) you could be making a huge error in the IRS’ favor. Although the ESPP program was discontinued at my workplace this year, one of my co-worker’s recently made this mistake and he’ll have to amend his 2012 return. It all has to do with the way the gains are reported by your financial institution and employer. You could very easily be paying double taxes and not even know it due to a simple lack of communication from your employer. A couple years ago when I was doing my taxes myself, I noticed that my refund was way less than it should have been. I poured over the numbers for hours and couldn’t find any mistakes anywhere though. Eventually, I calculated everything step by step and found out that I was paying double taxes on the earnings from my ESPP. The plan requires a 6 month holding period on shares purchased after the purchase date. If the stock is held for 1 year after purchase, only the discount is taxed as ordinary income and the rest is given the more favorable capital gains tax treatment. If the stock is held for less than 1 year after purchase, the final sales price – the discount price is taxed as ordinary income. Let’s say I purchased 100 shares on the excise date Jan. 3, 2012. Even though the price was $123.25 on the excise date, the price at the beginning of the year(grant date) was $87.75 so I received a 15% discount on the latter. So right off the bat, I already had a gain of $4,867 dollars($12,325-$7,458). And since the sale of our company was impending, I was able to sell the stocks the next week at $124.34 for a total of $12,434. So my short term capital gains were only $109 while my ordinary income from the sale was $4,867. 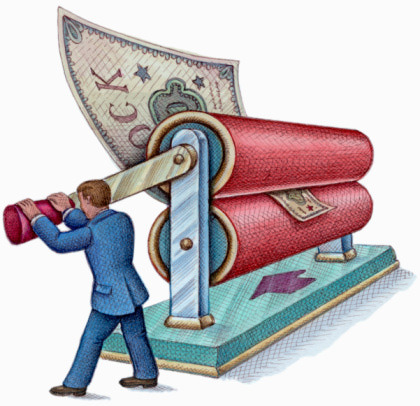 What Does Your Financial Institution Have to Say About It? After all is said and done, your employer should report the $4,867 as ordinary income on your W2 and your financial institution(in my case Fidelity) should report the $109 as capital gains. And here’s where it gets complicated. Fidelity doesn’t know about the discount or the special tax treatment, they see that you acquired the stock at $74.58 and sold at $124.34. So on my 1099, they will report a gain of $4,976 while my employer will also report ordinary income of $4,867. So who’s right and who’s wrong? Well technically, it’s up to you to manually go in and adjust the cost basis of your stock on your 1099. 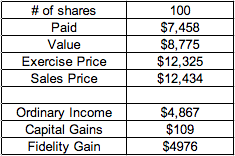 All you have to do is change the cost from the exercise price paid per share($74.58) to the fair market value per share on exercise date($123.25). As you can see, this can make a huge difference in your tax return. Either way, you’ll have to pay ordinary income tax on the gains but if you don’t adjust the cost basis you will be paying extra short term capital gain taxes too(which is ironically enough the same as your ordinary income tax rate)! I feel really bad for anyone who made this error and didn’t realize it since they effectively paid double taxes and might never even know about it. It’s really easy to miss this error since Turbo Tax allows you to auto-import your W2 and 1099. I don’t think this necessarily means you should always take your taxes to a CPA since I don’t know for sure if they would even catch this mistake. Instead, make sure you always do a common sense check on your taxes. Do a couple hand calculations yourself and make sure the numbers all add up, that’s the only way to catch things like this. Readers, have you ever made a similar tax reporting mistake and if so how did you handle it? Do you have an ESPP and did you know about the complex tax treatments? Wow, great point. My stock purchase plan is very similar to this example so you’re making me second guess my taxes from last year. I don’t think I paid double, but I’ll have to check. Thanks Jake. I don’t know if every financial institution/company report the numbers in the same way so I’d be curious to see what your findings are. I get RSUs. They seem a lot simpler from a tax perspective. Basically, it gets split up really nicely. So let’s say that on vesting day, my company’s stock is worth a nice round $100/share and I have 100 shares vesting that day. My company will report 100 x $100 = $10,000 in ordinary income. I’ll see a normal pay statement and everything. Somehow, 25% federal income tax, 6.2% Social Security tax (if I haven’t hit the max yet) and 1.45% Medicare tax has to be paid for that income. Those taxes usually come out of the brokerage account on the settlement date of sell date + 3 business days. a) If I choose to sell all shares immediately, the brokerage firm will sell all 100 shares and deposit the cash into my money market account. The brokerage firm will issue me a 1099 for the stock sale, which results in a small capital loss for the commissions. b) If I choose to sell shares to cover the taxes, the brokerage firm will sell ROUNDUP($10,000x(0.25+0.062+0.145)/$100)=33 shares, deposit the cash into my money market account. The brokerage firm will issue me a 1099 for the stock sale, which results in a small capital loss for the commissions. Now I have 67 shares that I can sell at any time, as if I’d bought them with my own money at a cost basis of $100/share. c) I deposit enough to cover the taxes into my money market account before the date I expect the money to be taken out ($3,265). No 1099 is issued and now I have 100 shares that I can sell at any time, as if I’d bought them with my own money at a cost basis of $100/share. I’ve been mostly going with option a) for now. I don’t want that much stock in my employer. I may go with one of the other options once the mortgage is paid off and then hold the shares for a year until the long-term capital gains kick in, we’ll see in another couple years when the mortgage is paid off. Interesting, thanks for the breakdown. I’d never even heard of RSU’s until you mentioned them to me to be honest but they sound like a pretty good deal. I’m bummed that my company got rid of our ESPP but I’m leaving anyways in a week and a half so no big deal anymore!